Once upon a time there were three sisters. One of them, being the prettiest, married very well, the second one, a bit wild, married very badly but for love and the third one married just because it was the right thing to do. The first sister, Lady Bertram, a rich wife of a baronet, was spending her days idly by the side of her husband, Sir Thomas, enjoying luxuries of Mansfield Park, their country estate. She had four children: two sons, Tom and Edmund, and two daughters, Maria and Julia. She also decided to help her other two sisters, less fortunate when it came to the choice of husbands. That’s how Fanny Price, our heroine, aged just 10, arrived to Mansfield Park – she was Aunt Bertram’s charity case. As one of many children of the second sister, Frances, and Lieut. Price, a retired naval officer, Fanny was sent away to live with her fine relatives. Her mother was very grateful as it was considered a great opportunity and social advancement. Of course nobody asked the opinion of the shy, awkward child. Fanny was never exactly mistreated by the Bertrams but she never felt at home with them either. Still Edmund, the younger son, being the most good-natured of all, managed to show his young cousin real kindness from time to time. Fanny’s other maternal aunt, Mrs. Norris, the local parson’s wife, showered attention and affection on her Bertram nieces, particularly Maria, but was frequently unpleasant and mean-spirited toward Fanny, making the girl feeing inadequate. The narration starts when Fanny is 16. Sir Thomas must leave for a year to deal with problems on his plantation in Antiqua. He takes his eldest son, Tom, along in hopes to isolate him from bad company he had been keeping. Meanwhile Mrs. Norris finds a husband for Maria Bertram – a completely stupid but very rich Mr. Rushworth. Maria accepts his proposal subject to Sir Thomas’s approval on his return. About this time, the fashionable, wealthy, and worldly Henry Crawford and his sister, Mary , arrive at the parsonage to stay with Mrs. Grant, their half-sister. The arrival of the lively, attractive Crawford siblings disrupts the staid world of Mansfield and sparks a series of romantic entanglements. Mary and Edmund begin to form an attachment, despite her original interest in Tom as the eldest son and the heir of Mansfield Park. Although Edmund worries that Mary’s cynical remarks may mask a lack of firm principle and Mary is unhappy that Edmund wants to become just a simple country clergyman, their mutual attraction grows. Fanny fears that Mary has enchanted Edmund, and that love has blinded him to her flaws – of course, she is in love with him herself but her judgment is definitely better than the judgment of any of interesting parties. Meanwhile, during a visit to Mr. Rushworth’s ancestral estate in Sotherton, Henry deliberately plays with the affections of both Maria and Julia, driving them apart. Maria believes that Henry is falling in love with her and treats Mr. Rushworth dismissively, provoking his jealousy. Fanny witnesses Maria and Henry in compromising situation and is appalled by their lack of decency. Encouraged by Tom and his friend Mr. Yates, the young people decide to put on Elizabeth Inchbald’s play Lovers’ Vows, a rather frivolous farce which allows Henry, Maria, Julia, Mary and, to some extend, Edmund continue their public flirt. When Sir Thomas unexpectedly arrives home in the middle of a rehearsal, the theatricals are abruptly terminated. Henry, whom Maria had expected to propose, leaves, and she feels crushed, realizing that he didn’t love her. Although she neither likes nor respects Mr. Rushworth, she goes ahead and marries him out of spite. They leave for Brighton, taking Julia with them. With Maria and Julia gone, Fanny and Mary Crawford are naturally thrown into each other’s company. In fact Mary goes out of her way to befriend Fanny. Henry returns to Mansfield Park and, lacking other distractions, decides to amuse himself by making love to the shy new best friend of his sister. However, Fanny is steadfastly if secretly in love with Edmund, and the tables are turned – Henry actually falls in love with her. To further his suit, he uses his family connections to raise Fanny’s brother William to the rank of naval lieutenant. However, when he proposes marriage, Fanny rejects him out of hand, partially because she disapproves of his moral character, and also because she still hopes Edmund might love her back one day. Sir Thomas is dismayed and startled by her refusal, since it is an extremely advantageous match for a girl without any dowry or useful connections. To bring Fanny to her senses, Sir Thomas sends her home to Portsmouth, hoping that the lack of comforts will help her appreciate Henry’s offer more. At Portsmouth, she develops a firm bond with her younger sister Susan, but is taken aback by the contrast between the dissolute surroundings of her mother’s house and the environment at Mansfield. Henry visits and tries to convince her that he has changed for good and is worthy of her affection. Although Fanny still maintains that she cannot marry him, her attitude begins to soften, particularly as Edmund and Mary seem to be moving steadily toward an engagement.Henry leaves for London, and shortly afterwards, Fanny learns that scandal has enveloped him and Maria. The two had met at a party and rekindled their flirtation; as a result Maria has left her husband for him. A national scandal sheet gets wind of the affair, Maria is exposed as an adulterous wife, Mr. Rushworth sues for divorce, and the proud Bertram family is devastated. To make matters worse, Tom has taken ill, and Julia, fearing that her father will lock her up, punishing for the sins of the older sister, has eloped with Tom’s flighty friend Mr. Yates. In the midst of this crisis, Fanny returns to Mansfield Park with her sister, Susan. Sir Thomas realizes that Fanny was right to reject Henry’s proposal and now regards her as his daughter. During an emotional meeting with Mary Crawford, Edmund discovers that Mary does not condemn Henry and Maria’s adultery, only the fact it was discovered. She implies that if Fanny had only accepted Henry, there would have been no affair. She also speaks very callously about the possible death of Tom and the perspectives it would create for the younger son. Edmund, who had idolized Mary, feels that her true, rather ugly nature, has been finally revealed to him. He returns to Mansfield Park and goes ahead with plans to be ordained a minister, abandoning any engagement plans.While he is despairing of ever getting over Mary, Edmund comes to realize how important Fanny became to him. After a while he declares his love for her, they are married, and eventually they move to the Mansfield Park parsonage, where they live close to those they love best. Henry Crawford refuses to marry Maria, who is banished by her family to live, secluded, “in another country,” (France) where she is joined by her aunt Mrs. Norris, the initial creator of her misery. If you wonder why my synopsis is so long and detailed here are two main reasons. First – I admit that Mansfield Park is my favourite Jane Austen book and I can talk about it forever. Second – I wanted to show how dissimilar that novel is when compared to those awful movie adaptations. Really, truly, completely different. First of all the main heroine, Fanny, is perhaps the most complex female character created by Austen, maybe because she is portrayed not as a young adult but we can follow most of her childhood as well. Plenty of readers don’t like Fanny for being a bit priggish. Jane Austen’s own mother thought Fanny “insipid”. I don’t agree with such an assessment. Although, as any young girl, she is sometimes given to wishful thinking and she is often too timid to speak up her mind, Fanny can be surprisingly perceptive and intelligent; it is quite stunning as she lacked any moral guidance or support among her real or adoptive family. Still she is the only one who can assess the Crawfords in the right way, she notices how badly Maria treats her fiancé before almost anybody else and she can criticize the household of her own mother in a very clear-headed way. By rejecting Henry she shows a lot of courage; she also grows in self-esteem during the latter part of the story, weathering a major crisis caused by Maria’s divorce and Tom’s illness. Apart from Fanny there are plenty of other great characters, presented here, but two of them, namely Henry and Mary Crawford deserve a paragraph or two of their own. They are a pair of antagonists, predators, but they are presented as quite likeable creatures, so nice to be with and so interesting nobody notices their wickedness. Let’s start with the lady. I would describe Mary Crawford as Elizabeth Bennett without moral principles – she is clever, she has a great sense of humour, she is additionally rich (twenty thousand pounds of dowry, no small matter) and pretty spoiled. You might argue that her faults stem from the fact that she wasn’t given proper education and example in her childhood but so wasn’t Fanny and there is vast difference between the way of thinking of these two young women. Mary is so dazzled by the glitter of the beau monde that she rarely notices any real values in people. She likes luxury, she appreciates theatre and fun, she thinks she is entitled to everything the best, including men. Although from time to time she can be also understanding, generous and kind, she thinks mostly about her own convenience and social status. She tolerates Fanny to please Edmund and Sir Thomas but, given a choice, she remorselessly forgets her timid friend to enjoy a more interesting company. Her brother is even worse – it is a predator similar to Monsieur Vicomte de Valmont from Les Liaisons Dangereuses, another classic reviewed by me here. As he has definitely too much money for his own good and is too lazy and lax to find himself a proper occupation he preys on women for fun (mind you we speak about the Napoleonic Wars period, such easy time to find an occupation for an aggressive, clever man of means!). The way he plays both sisters Bertram is really callous and ruthless; after the marriage of Maria he doesn’t hesitate to contact her in public and when she pretends reserve he decides to conquer her again – not because he loves her but because he must prove his seductive skills before himself and all the world around. Of course the fact that he might be ruining more than one life and a reputation of the whole family in the process never even crosses his mind. He would do anything and everything for a moment of thrill. One small carping: I really hated the fact that Jane Austen didn’t punish Henry Crawford for his villainy. While Maria Bertram was sent into exile in the really acidic company of her aunt Norris he was left with all the privileges of a rich squire and his reputation didn’t suffer either. NOT FAIR. His only punishment? He didn’t get Fanny and he knew what he lost. I wish Austen at least made him poor (gambling?) and then forced him to marry for money some horrible harpy, twice his age. I may risk a statement that Mansfield Park is not an easy novel to understand. It enjoys that dubious distinction of being disliked by more of Jane Austen’s fans than any of her other novels. Perhaps it is because its themes are very different from those of her other books, which can generally be summed up by one sentence or, indeed a phrase: Sense and Sensibility is about balancing emotions and reason, Pride and Prejudice is about consequences of judging others too quickly, Emma is about growing into adulthood while being terribly nosy, and Persuasion is about giving others and yourself second chances. The theme of Mansfield Park, on the other hand, defies such a simple description. Is it an allegory of Regency England? Is it about the negative impact of slavery? Is it about the right and wrong education of children? Is it about the difference between appearances and reality? Is it about the consequences of breaking with society’s rigid rules? In my opinion any, or all of those themes can, and have been applied to Mansfield Park – let it be the proof that this novel is something truly exceptional and worth reading. 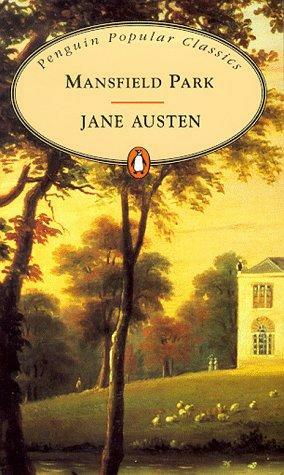 This entry was posted in book review, classic and tagged Jane Austen. Bookmark the permalink. I really enjoyed Mansfield Park as well. I really liked Fanny Price. I could have smacked Edmund for being so slow.